Recently, LinkedIn is pretty much back into the limelight. Remember those days were LinkedIn was just ‘another’ social media platform for marketers? LinkedIn was desperate for traffic and market share in the competitive social media industry. Since the launch of their video functions, marketers are literally going back to LinkedIn. This feature doesn’t only gave LinkedIn a new set of opportunities to compete, it helped them to gain the much market share they once lost. 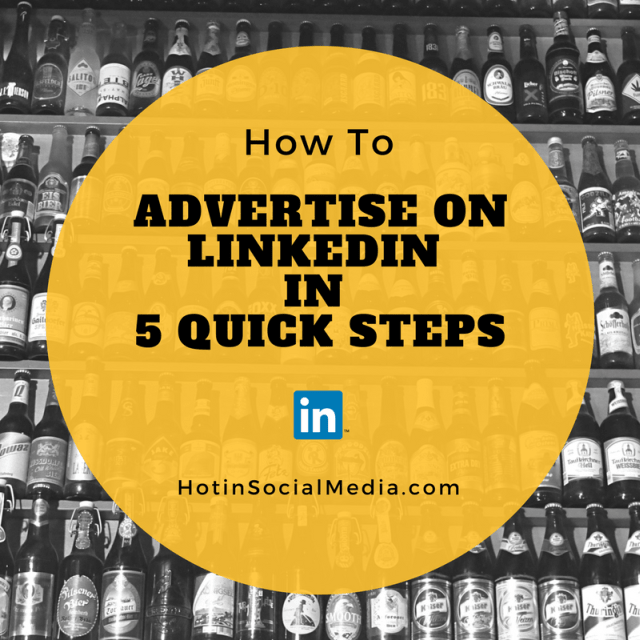 Are you ready to take a deep dive into how to advertise on LinkedIn in 5 steps? Let’s start with the basic and learn quickly how you can start using LinkedIn for advertising today! Advertising on LinkedIn is like advertising on Facebook. You can only advertise when you have an ad manager. In this case, you need to have a campaign manager to get the advertising on LinkedIn rolling. According to LinkedIn, it’s Campaign Manager is LinkedIn’s all-in-one advertising platforms. It simply means that you can do way a lot more things with the Campaign Manager. 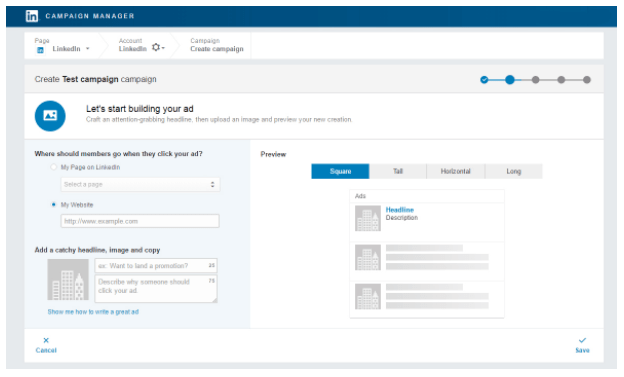 As a matter of fact, you can do all forms of advertising on LinkedIn using its Campaign Manager instead of using multiple tools and functions to manage different advertisements. Basically, the Campaign Manager ould you far more access especially for you to gauge the effectiveness of your advertising on LinkedIn. As advertisers, you can choose the format for the delivery of ads in specific areas. And if you are wondering, yes, you can advertise on all three types of advertising segments as well. Typically, Sponsored Content works like Sponsored Post on Facebook. This is often considered the best as it can provide you with the most eyeballs to your advertisement. Sponsored Content can be visible on all devices, supports rich media and at the same time, you can easily tweak your advertisement to compare the results. Sponsored InMail is slightly different and it is only visible in the selected section of the content. Typically, this form of ad format is only delivered via LinkedIn Messenger and it is often very personalized for the audience. Sponsored InMail allows you to drive higher conversion through personalized messages, reach targeted audiences on both mobile and desktop, and as well as using A/B/ testing to get better results. Last but not least, Text Ads is the simplest form of advertising on LinkedIn. For many marketers, Text Ads is also a very interesting PPC (pay per click) ads or CPM (cost per impression) ads model. The third step is to create a relevant ad and start targeting the right audience. Depending on your specific ads choice, it will vary a little. However, the concept remains the same. In this example, I’ll be using Text Ads and showing you how you can easily create an ad for that purpose. Basically, the first step is to understand where the visitors will be redirected to when they click on your ad. It can be one of your LinkedIn page or posts or a specific page outside of LinkedIn. Personally, I recommend you to direct all traffic to a landing page because it is going to improve your conversion rates in many ways. Plus, you can also collect emails and be retargeting the audience at a different period of time. Next, consider adding your image (I recommend using stock images instead of using Google images). The content of the headline should be no more than 25 characters and add a description that must be up to 75 characters. The beauty of using LinkedIn Campaign Manager allows you to see the changes done on the right side of the web page. LinkedIn allows you to create a maximum of 15 different Text Ads for you to perform split testing. This means that you can test out which headline, description and images give you the top results (as well as engagement). 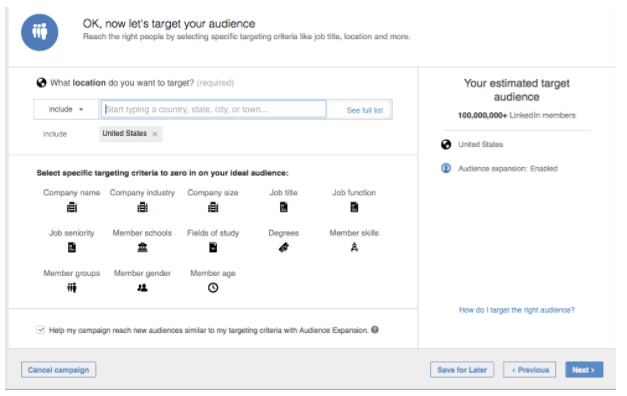 Targeting your audience is another critical part of the success of your LinkedIn Ads. The process is similar regardless you are using which form of ads. The option to define your target audience will only be visible after completing your ads. Take a look at the image below for more information. Budget, budget, and budget. This is where you set your advertising budget. If you are just starting to use LinkedIn for business, consider using a small amount to ensure that you can try out the advertising feature. There are 3 things you need to know. Cost per send (CPS) is only applicable when you use Sponsored InMail campaigns. Cost per click is often used in action-oriented campaigns like event registration or lead generation. Cost per impression is best used when the main goal is brand awareness. Again, you can take the look at the image below for better understanding. As you can see, you can tweak the values to fit your overall marketing budget. Using LinkedIn Campaign Manager, you can access it at any time to gauge the overall performance of your campaign. Typically, I would recommend checking on the LinkedIn Ads performance a few days after launching the campaign. 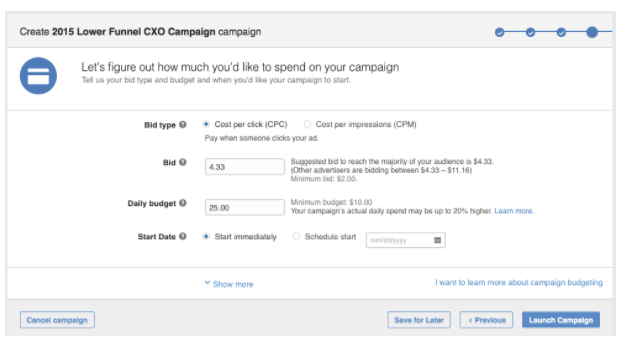 Measure the progress of your LinkedIn Ads campaigns is critical for success. You should not take this lightly and consider making timely updates on your ads campaigns to maximize the results. Advertising on LinkedIn is just like advertising on other social platforms. Constant optimization and measurement are very important to ensure that you are hitting your goals. What is your opinion about Linkedin advertising? 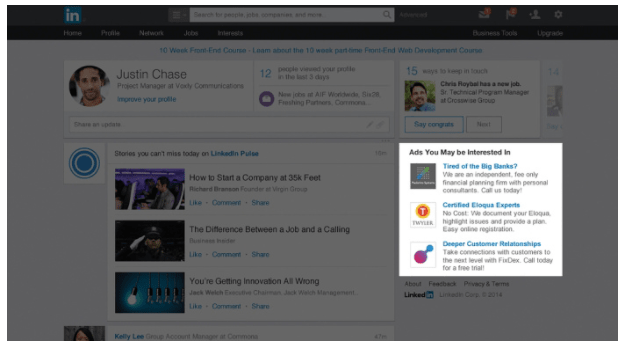 Are you using LinkedIn ads already? Leave a comment below and tell us all about it!